Marketing is enveloping trend in modern competitive world as it contributes greatly for the productivity of firms. The term 'marketing management' consists of two different words, 'marketing' and 'management'. Marketing is an economic process by which the commodities and services are acquired in exchange of money. In management literature, the meaning of 'marketing' denotes to the procedure of distribution of goods or products from the producers to the final consumers. Marketing includes advertising, promotions, public relations, and sales. It is the procedure of introducing and promoting the product or service into the market and enhancing sales from the buying public. Management is meant the coordinating of efforts of other people intended for the fulfilment of the predetermined objectives. Stanley Vance has articulated that the 'management' is normally the decision taking and control upon human activities method by which major objectives could be accomplished. Concept of marketing management: Marketing management is significant section of management process which envelops the distribution of marketing activities. According to theorist, Rustom S. Davar, The term ‘marketing management’ means the discovering of the consumers’ needs, converting them into the products or services and the activity of transforming the product or service to the ultimate consumer, so that needs of specific categories or groups of the customers could be so satisfied that by the most favourable utilization of the resources, they could derive the maximum benefits. Bulk of literature has demonstrated that “Marketing Management is the core procedure to allocate the resources of the organization toward marketing activities. The main role of a marketing manager is to direct expenditures of marketing funds. Cundiff and Still stated that the marketing management is that branch of the general management which is associated with the direction of activities in order to achieve objects concerned with distribution. It can be established that the marketing management is that managerial or management function which performs the marketing activities. Marketing management is the art and science of selecting target markets and getting, keeping, and growing customers through creating, delivering and communicating superior customer value. According to Kotler, “Marketing is a social and managerial process by which individuals and groups obtain what they need and want through creating and exchanging products and value with others” (Kotler et al, 2015). Evolution: Marketing Management is the area of management that focused on the practical use of marketing systems and the management of an organization’s marketing resources and activities to create a demand for the products. 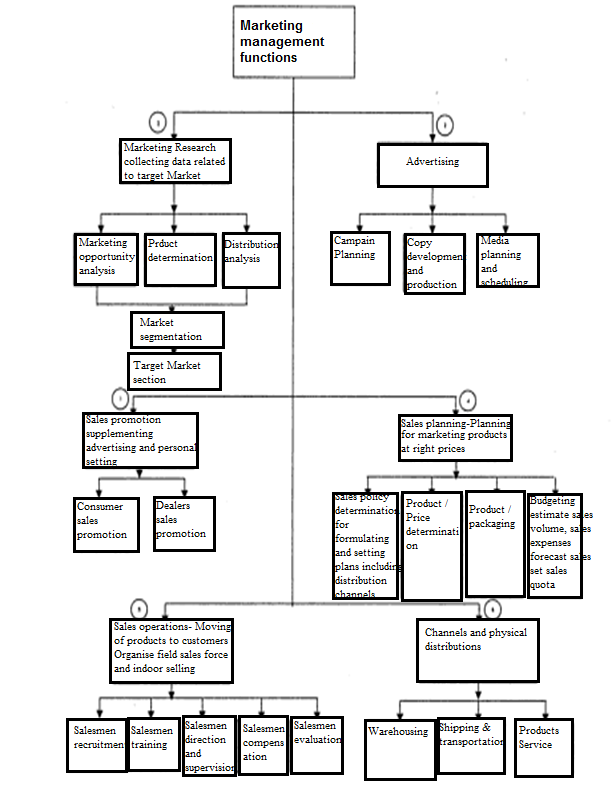 The theory of marketing was studied by marketing scholars and analysts during 1990. Marketing strategies explains fundamentals of marketing theory, executing marketing plans of firms to compete in global environment. Successful marketing approach enable a company to understand its consumers, opponents, and environment and in turn escalate productivity of company (Normann and Remirez, 1993). A major aspect in marketing is to collect essential information about the customer. If market practices are performed effectively then organization will smoothly communicate with customers and satisfy their needs (Lafferty and Hult, 2001). Conventionally, marketing management was divided into three silos, such as the 3 C’s, Customer analysis, Company analysis and Competitor analysis. After that, it has developed into an integrative five “Cs”: Customer analysis, Company analysis, Collaborator analysis, Competitor analysis, and Analysis of the industry Context. In marketing management, the planning cycle is involved in four basic steps. First, Planning is the process of investigating and understanding the surroundings within which the organization functions. This would include studying and gaining an understanding of such things as; competition, legislation and regulation, social and cultural trends, and technology. Both present and developing trends in each of these areas must be identified and monitored. In planning stage, managers are involved in creating documents that outline the organization’s intended response to these environmental variables. Second stage is implementation in which plans are put into action. It is the changeover from expected reality to existing reality. Third stage is the monitoring process which involves tracking plans and identifying how plans related to changes that take place during program operation when more information is acquired. Correction is the fourth stage in which managers take action to return their plan to the desired state based on feedback obtained in the monitoring stage. It can be concluded that the marketing management cycle is composed of planning, implementing, monitoring, and correcting. The foundation of modern marketing management has been laid on the concept of marketing mix paradigm. This concept was introduced by Neil Borden in 1950 and popularised by Mc Garthy in 1960. Marketing mix composed of four concepts that include product, price, promotion and place. These factors have evolved the tool of marketing management. Product: Goods produced by organizations for the customers are called products. Products can be of two types such as Tangible Product and Intangible Product (Services). A product in a market place is something which a retailer sells to the buyers in exchange of money. Price: The money which a purchaser pays for a product is called as price of the product. The price of a product is indirectly proportional to its availability in the market. Place: Place denotes to the location where the products are available and can be sold or purchased. Shoppers can purchase products either from physical markets or from virtual markets. In a physical market, buyers and sellers can actually meet and interact with each other whereas in a virtual market buyers and sellers meet through internet. Promotion: Promotion refers to the various techniques and ideas executed by the marketers to generate awareness among end users. Promotion includes various techniques employed to promote and make a brand popular amongst the masses. Specific functions of marketing management include market research, advertising, sales promotion, sales planning, sales operation, physical planning. Advertising: It is a mass media tool for marketers in consumer goods markets. Advertising is an impersonal presentation and promotion of ideas, products and services paid by the sponsor. Sales promotion: It is a short term incentive to supplement personal selling and advertising. It is sued by marketers at the time of launching new products. Sales planning: This function involves the planning of right products at correct prices. It includes formulating sales plans, price and quantity determination, packaging and budgeting. Sales operations: This function is concerned with transferring of product to the customer point. Physical distribution: Moving and handling of products come under physical distribution. Order processing, inventory, warehouse and transportation are key decision to be accessed in Physical distribution system. Marketing management has gained significance to meet increasing competition and the need for improved methods of distribution to decrease cost and to boost profits. In current business situation, marketing management is the most important function for organization. The following are major factors that reveal significance of the marketing management. Introduction of new products in the market. Increasing the production of existing products. Reducing cost of sales and distribution. Development in the means of communication and modes of transportation within and outside the country. Rise in per capita income and demand for more goods by the consumers. Management studies have shown that marketing management uses various tools from economics and competitive strategy to analyse the industry context in which the firm operates. These include Porter's five forces, analysis of strategic groups of competitors, value chain analysis and others. In competitor analysis, marketers develop detailed profiles of each opponent in the market, focusing especially on their relative competitive strengths and weaknesses using SWOT analysis. Marketing managers will scrutinize each competitor's cost structure, sources of profits, resources and competencies, competitive positioning and product differentiation, degree of vertical integration, historical responses to industry developments, and other factors. In competitive environment, the industrialization is speedily progressing and effective and well organized methods of marketing are evolved. Due to the planned economic development, there is huge progress in agricultural and industrial spheres. The production of the primate and public sectors has also sufficiently gone up. In Indian economy, the marketing management has great significance which is described below. Procuring Maximum Results with Minimum Efforts: In Indian country, the resources are quite limited; hence the industrial units are essentially required to be alert against their productivity. By the minimum efforts, managers have to achieve the maximum results; it could be possible only when they understand the significance of ‘marketing’. Worth from the Export Market Viewpoint: To enhance economic development rapidly, it is essential to increase the export trade. The success of our Five Year Plans basically depends upon the possibilities and successes of export trade. The export trade could develop only when professional managers possess the knowledge of the latest techniques of marketing. To develop the export trade, managers must have to expand national market, so that whatever they lose in exports could be met by the domestic markets. In this perspective, the marketing occupies sufficient significance. The exporters must pay greater attention on the marketing research and market analysis. The new marketing devices must be developed so that faith among the customers could be created towards the products. Significance from the Rural Regions perspective: Due to the economic development in Five-Year Plans, there has been the change in the habits and expenses not only among the urban population, but also in the rural area. Due to the Green Revolution, there have been enough changes in the villages. Due to the increase in the people's incomes, today there have been development of the demand for new and comfortable products in the villages. In India, there are enough opportunities for the development of the marketing activities in the rural areas. Significance of Marketing Along with Rapid Industrialization: Since the time when the government had determined about improving the economy of the country by means of the Five-Year Plans, main focus is on the industrialization. The attitudes towards the standard of living of people have been changing and there has been sufficient change in the attitudes and interests, wants of the people and along with the same, the importance of marketing management too has begun increasing. Selecting the right market – It is essential to understand how to choose the best market so as to get new consumers and even retain the old ones. A good marketing manager should understand the forces of demand and supply in the market. This helps in meeting the consumers demand at different times. It will help in increasing in sales for a given period of time. When choosing the right market there is various factors that must be considered such as the location and size of the business. Gains and losses assessment: Understanding the market dynamics is also essential in analysing possibilities of making a gain or incurring a loss in any business. Effective means of communication: Good communication between the marketer and customers is also very important in business. This helps in attracting more potential customers and therefore increasing the volume of sales. It is important to ensure that the business has an effective customer service support team. This ensures that the consumers review on the product is considered. Proper management of all marketing departments: Succeeding in marketing management involves proper running of marketing departments such as sales, pricing, operations and finance. Research on business and the market: It is good to study thorough details about the business that assists in strategizing on the most appropriate ways to market a product. Strategic planning and marketing management should go hand in hand. The major approaches used in strategic planning include; competitor analysis, company analysis and customer analysis. Competitor analysis involves analysing the prices of the competitor products and their nature. This helps the company to prospect the profit. Making strategic decisions: After in depth study and research on business and other market dynamics, it is easy to design practical marketing strategies. To sum up, marketing management is described as the process of management of marketing programmes to achieve organisational goals and objectives. According to management theorists, it is the art and science of selecting target markets and getting, keeping, and growing consumers through creating, delivering, and communicating better customer value. It involves planning, implementation and control of marketing programmes or campaigns. The main task of marketing management is to simulate and attract demand for product. Marketing management basically associated with the practical application of marketing practices and the use of the resources and activities to fulfil its task to attain the company objectives.